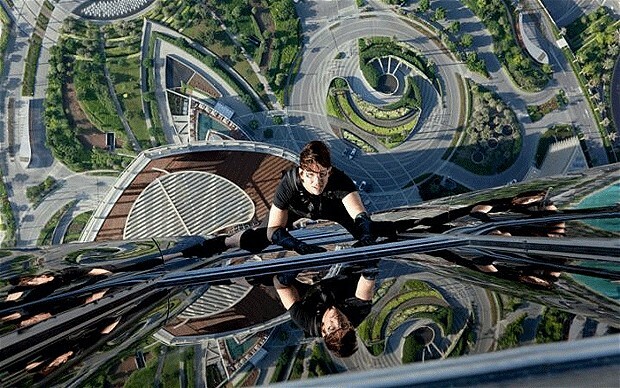 Tom Cruise scales one of the world’s tallest buildings. Since 2005, Tom Cruise’s career has been floundering, with a string of box-office disappointments (Lions for Lambs, Valkyrie, Knight and Day) doing little to keep him current and popular. Luckily for Cruise, Ethan Hunt, the protagonist of his Mission: Impossible franchise, has always been his most bankable and successful character. However, Ghost Protocol, the fourth entry in the series, does more than give Cruise another hit – the film re-establishes him as an action star, and also breathes new life into the series (the last M:I was released in 2006). Ghost Protocol begins with a bang: Ethan Hunt, superspy extraordinaire, is broken out of a Moscow prison in a sequence so effortlessly cool that it’s also wildly entertaining. Dean Martin’s “Ain’t That a Kick in the Head” plays through a cell block as Hunt practices his martial arts moves on unfortunate prison guards while tech whiz Benji (Simon Pegg) wreaks havoc by opening cell doors at random. Following that exhilarating opening, Hunt, partnering with Benji and beautiful, driven agent Jane Foster (Paula Patton), jump headfirst into another suitably impossible mission: infiltrating the Kremlin. No sooner than they accomplish this, however, do they realize that it’s a set-up, and an enemy team is already in position. They narrowly escape the Kremlin, which is then blown up (in suitably spectacular fashion). The entire Impossible Missions Force is disavowed, so Hunt and his team must clear their names and track down the terrorist group while also fleeing the government they’ve dedicated their lives to protecting. One thing that Ghost Protocol really has going for it is its sharp, sometimes laugh-out-loud funny script. A danger that every action franchise faces is losing its appeal by either becoming too tiresome and brutal, or too silly and implausible. If Ghost Protocol is any indication, the M:I franchise is going to be just fine. Ghost Protocol expertly navigates between action and humor, giving all of the characters room to deliver some great one-liners but stopping their interactions from dissolving into absurdity. The acting in Ghost Protocol is exceptional, especially for this kind of film. Oscar nominee Jeremy Renner brings gravitas and mystery to his character, while Tom Cruise proves why he’s still atop Hollywood’s A-list by giving Hunt a caginess and manic energy perfect for this kind of popcorn movie. Michael Nyqvist (Blomkvist in the original Girl with the Dragon Tattoo) is spot-on as the menacing villain Hendricks, while the lovely Paula Patton shows off impressive dramatic chops. The standout, however, is Simon Pegg, hilarious, witty and earnest. He’s the loyal sidekick every action movie wishes it could have. This entry was posted in Reviews and tagged 2011, action, adventure, mission impossible, paula patton, review, sequel, simon pegg, tom cruise. Bookmark the permalink. Nice write-up Isaac. Keep up the good work.